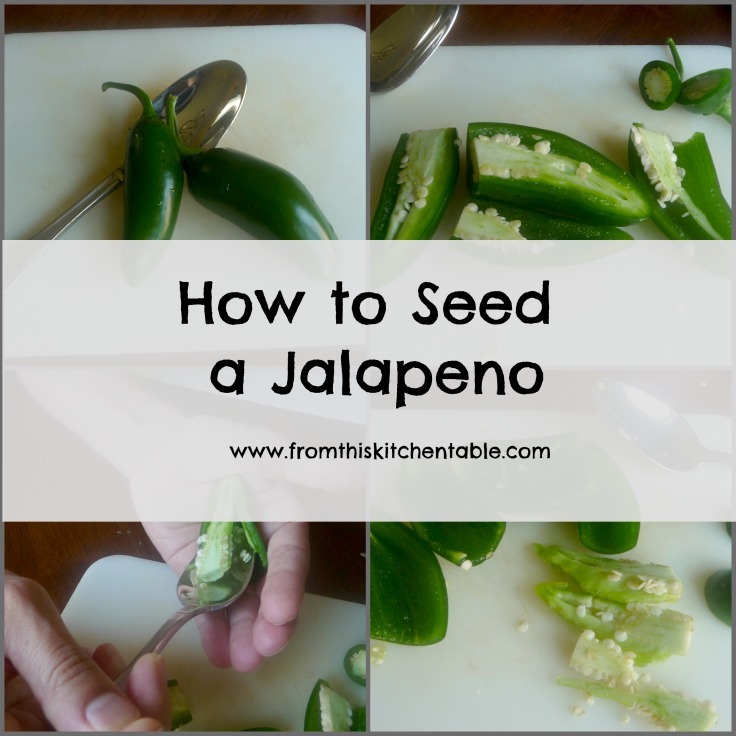 I know there are lots of people out there smarter than me, so you might have already discovered this amazing trick to seed a jalapeno or serrano but if not I’ll share my trick! Up until a few years ago I was using a knife to get the seeds out and would also get seeds on my fingers tips and at some point during the day end up with watering eyes after a rubbed them. Then I got smart(er). 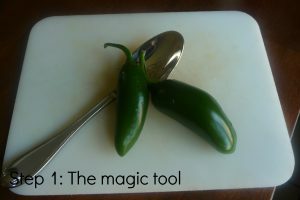 One day when I was in the kitchen getting ready to cut into some peppers I saw a spoon on the counter and an idea popped into my head! I tried it out and guess what? It worked. I’ve been using it ever since. 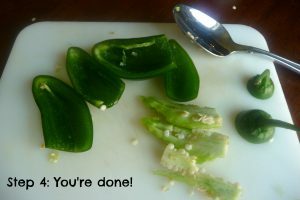 First you’ll want to gather your supplies: a cutting board, knife, spoon and of course your jalapenos. 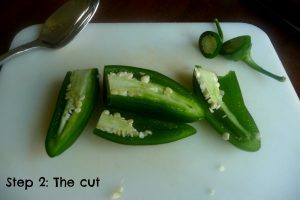 Next cut off the top of the jalapeno and then slice them in half. Here is were the magic happens. 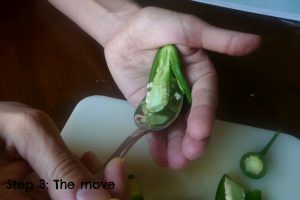 Place the jalapeno in the palm of your hand and take the spoon in your other hand and scrape those seeds out. Ta-da! That was it. You are done. Now you can proceed to mincing your pepper or adding it to the dish hole and enjoy not having your hands on fire. 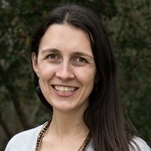 This entry was posted in Uncategorized on September 6, 2013 by Deanna Michaels. And I dice/cut, whatever with the flesh DOWN so that the juice doesn’t get all over my hands! I cut it flesh side UP once and my hands were burning for the rest of the day. Love this! Yes! That’s exactly what I do too. After its seeded I flip it over and try to just tough the skin. Ouch!!! Skin burning from hot peppers is so painful and it’s hard to remember not to touch my mouth or eyes and spread the burning. I like this idea! I’ve been cutting them up with plastic bags or gloves on my hands. Thanks! Plastic bags and gloves are a great idea too. I don’t have the gloves, but don’t know why the bags have never crossed my mind. Hi Deanna! Thanks for linking up at Let’s Get Real. I’ve been wanting to use fresh jalapeno in some recipes, but I’ve been afraid to try because of all of the horror stories I have heard about people burning their eyes. Your advice is giving me the confidence I need to give it a try. Gloves would definitely keep your hands safe!